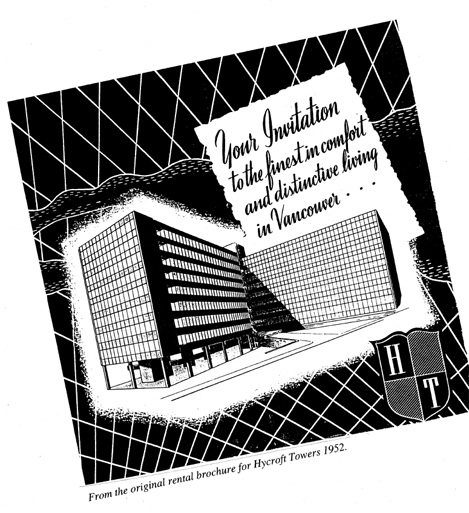 Hycroft Towers is one of Vancouver’s significant Modernist landmarks situated on a sloped triangular lot at Granville Street & 16th Avenue on the crest below Shaughnessy. Built in 1952 by Marwell Construction, Semmens & Simpson Architects (Harold Semmens & Douglas Simpson) & Otto Safir Engineer it is comprised of 3 wings, 5 exposures, 8 storeys & 158 suites. From 540 sqft one bedroom suites to 1699 sqft two bedroom & den suites they all offer the original wall to wall Critall windows from Britain, oak floors, efficient design & use of space with built-ins such as floor to ceiling cabinetry, drawers & vanities. The entire north wing features an expansive common rooftop garden & deck with panoramic views of the ocean, city & mountains as well as the Westside of Vancouver & trees of Shaughnessy. There is a strata-owned caretakers suite, interior murals by artist Lionel Thomas, a common laundry room, generous lockers & parking on both mezzanine & ground levels. The South Granville neighbourhood with all its amenities & proximity to Downtown, the Airport & UBC make this a prime location & investment. Originally marketed in the rental brochure as the ‘Canada’s Largest Apartment House’ when it was built the suites were later strata-titled and sold in 1973. Activity of sales within the building varies from year to year with 8 sales in 2014, 17 in 2015 & 13 in 2016. I have sold in Hycroft Towers for 26 years and represent the majority of the suites that have come for sale in the building over the last 2 decades. I enjoy introducing people to Hycroft Towers for the first time and showing them why it is in my opinion one of the best buildings in Vancouver. 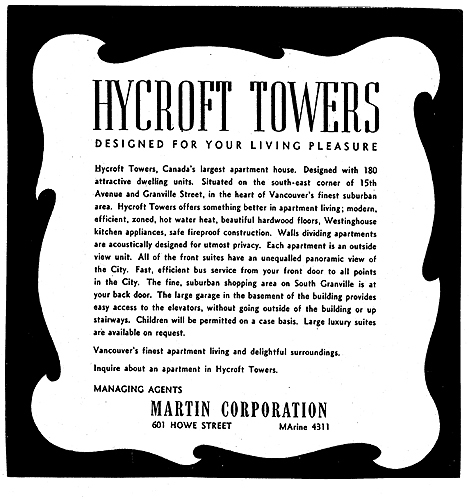 If you would like more information on Hycroft Towers or notification of new listings as they come on the market please do not hesitate to contact me.